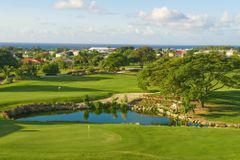 The Barbados Golf Club, located in the southern parish of Christ Church, is among the island's best established golfing venues, and is a popular choice for holiday makers visiting the tropical paradise. Host to the Barbados Open as well as the PGA Seniors in 2003, the Barbados Golf Club comes highly recommended. The most unique feature of the hugely enjoyable layout is the climax of each nine-hole loop; the two nines both return the clubhouse where they culminate at an unforgettable triple green that wraps around a beautiful yet extremely threatening lake. Holes 15 and 16 are potential card wreckers on the way home, but the course, which can stretch up to 6,649 yards, is sure to be enjoyed by golfers of all standards as part of a golf holiday on the special island of Barbados.